Fast desert endurance courses out of favour under proposed new rules? The fast desert courses favoured in endurance in the Middle East may struggle to meet rule requirements under proposed changes put before delegates at the Endurance Round Table of the FEI Sports Forum yesterday. Princess Haya looks likely to lead the fight for equestrianism within the Olympic movement, following a landslide vote at the International Equestrian Federation extraordinary general assembly in Lausanne. The horse-welfare crisis centred around the Dubai endurance stables of her husband, Sheikh Mohammed, has heightened concerns about International Olympic Committee scrutiny of equestrianism, but that did not convince delegates to oppose a change of statute permitting Haya to stand for a third term as FEI president. The vote was 103 to three. Unprecedented penalties for equine injuries, extended rest periods and increased accountability received the backing of national delegates at the FEI Sports Forum yesterday as the world governing body pressed on with reforms. The FEI described the initiatives as far-reaching, following the endurance round table on the second day of the third annual sports forum. The latest moves in the FEI’s bid to rein in excess fracture rates and other welfare concerns in the sport centred around the more aggressive flat desert form of endurance racing seen in some Group VII nations had the full support of delegates in the session in Lausanne, Switzerland. “The welfare of the horse is not just a veterinary issue, it’s an issue for all those who work in the sport,” said FEI 1st vice-president John McEwen, who also chairs the FEI Veterinary Committee. Spanish rider Jordi Arboix, riding Ainhoa Aksom, won the CEI** 120 km Uzes ride on 26 April 2014 by 7 seconds over former World Champion Barbara Lissarrague of Switerzerland riding Keeshan D'Aillas. Arboix's finish time was 5:58.52, for an average speed of 20.063 km/h. Catherine Roland of France was third, riding Spirit de Crouz, in 5:59.28. Spain's Alex Luque riding Anwar Jeromin finished fourth. 32 of 55 riders finished the course. LAUSANNE, SWITZERLAND — Princess Haya of Jordan will seek four more years as president of the International Equestrian Federation after overcoming critics of the body's links to her husband's operations. FEI member countries voted 103-3 to abolish a two-term limit she introduced, clearing their president to serve three consecutive terms. "I am very honored for the opportunity that you have given me to be available as a future president of the FEI," said Princess Haya, who did not take part in the debate or vote. The three "no" votes followed recent criticism of apparent conflicts of interest for the princess, who was elected in 2006 as a reformer to clean up the sport. Extreme weather forced the abandonment of the Fibre Fresh New Zealand Endurance Championships at Mayfield over Easter weekend, now plans are under way for a new event to wrap up the season for New Zealand riders. A two-day event has been added to the calendar at Taupo over the weekend of May 10 and 11. As well as offering FEI-level 3* 160km, 2* 120km, and 1* 100km rides for both senior and junior riders, there will also be several national rides from 20km to 100km in introductory, novice and open sections. This means that there will be no "National Championship" in New Zealand for 2014. Consideration was given to rescheduling the “Nationals” in another location, but it was felt that many members would be disadvantaged by this, given the tight time-frames involved. All entry fees received for the 2014 Nationals will be refunded. The FEI rides at the new Taupo event will be the last opportunity of the season for High Performance Squad members to achieve the final qualifications needed for the 2014 World Equestrian Games. It is also an opportunity to qualify horses for the star levels and to begin a campaign for the next Endurance World Championships and the Junior World Championships in Chile. A schedule will be sent out this week, with entries closing on Sunday, May 4. The abandonment of the 2014 Nationals has meant that organisers will incur a significant financial loss, but already several riders have indicated that they wish their entry fees to be left "in the kitty" to help cover expenses. The ESNZ Endurance Board is extremely grateful to those who have chosen to help in this way. Fronteira, Portugal: Auroro Torres Villalon led a one-two finish for Spanish riders in the CEI** Atoleiros endurance ride — the highlight of the second day of the Portuguese National Endurance Championships sponsored by the HH Shaikh Mansour Bin Zayed Al Nahyan Global Arabian Flat Racing Festival. Lola Gutierrez Parejo was second, while French contender Joel Marescassier took third aboard the 11-year-old chestnut mare Djitane De Leyre. It was a first major success for Villalon, who partnered the seven-year-old chestnut gelding Nabuco, while Parejo continued her good form following a victory in the Puerto Real show in February. UAE rider Aisha Darwish Al Romaithi showed the way in the first three loops but dropped to fifth place at the fourth vet gate, before being disqualified after an unfortunate fall. There will also be a venue for shows of regional products, handicraft, and performances of falconry and horse animation. All arrangements are well in place for the kickoff of the National Equestrian Endurance Championships with riders from all over the world vying for honours in the seniors and juniors categories at the border riding Centre in Fronteira, Portugal over this weekend. The current edition of the two-day event is organised under the patronage of Shaikh Mansoor bin Zayed Al Nahyan, Deputy Prime Minister and Minister of Presidential Affairs, as part of the Shaikh Mansour bin Zayed Al Nahyan Global Arabian Horse Flat Racing Festival which integrates the two major equine sports, flat and endurance races, under the same umbrella. Photographer and journalist Pamela Burton won the 2014 HH Sheikha Fatima Bint Mubarak Darley Award for "Best Lady Photographer" at the 27th Annual HH Sheikha Fatima Bint Mubarak Darley Awards. Held in Hollywood on April 4, 2014, and known as the 'Oscars of Arabian Racing', the awards honor the outstanding horses and humans in the US Arabian racing industry. Burton is known for her exceptional international photography and reporting on Arabian endurance, racing, and shows around the world on her website Horsereporter.com - "Bringing you to the world of Arabian horses." NSWERA’s premier event, its State Championships, will this year be held as a “Curtain Raiser” ride for the Tom Quilty 50th Anniversary for 2015! We hope to make this event the most exciting State ride to date, with large numbers expected from interstate as well as anyone who wants to qualify for next year. We hope that the success of 2014 will lead into the 2015 Quilty having the prestige it deserves as the culmination of 50 years of endurance in Australia and that feedback from this test event will assist us in covering areas in need of improvement. As this is your State’s premier event and its being run by NSWERA in preparation for our showcase, we ask that you all embrace and assist where you can! Ride Base : Del Rio is an excellent Ride Base with a multitude of great amenities and scenically located on the banks of the Hawkesbury River …so we pray for a flood free year! We ask that you follow maps and not your GPS to get there as it is only accessible via the Webbs Creek Ferry at the bottom of Wisemans Ferry hill and down to the left. Once off the Ferry turn left again and follow the signs to Del Rio. If coming from the Hunter, you can come down through St Albans on the Webbs Creek side of the McDonald River and turn right just before the Ferry. There are many hot showers and toilets available and there is a coin operated laundry available for those staying a little longer. Base will open on Tuesday after the Long weekend, strictly not beforehand and a list things to do locally will be available on the website soon. Also available will be a list of service stations that are ‘gooseneck’ and large horse truck friendly locally together with a list of dog kennels for those that need something for their best friends as they are unable to visit Del Rio. and you will be put on a register for regular email/phone contact. Beautifully embroidered kersey rugs are selling out at $220 and Clubs, Studs, Zones etc. are invited to sponsor these. All first place and Best Conditioned rugs are sponsored by Mackinder Endurance and others so far are Zone One, Shahzada, Rosemont, Lachlan Endurance Riders and Kintamani Arabians. Teams will once again be sponsored by D-Lua Park with the winning Team of 4 receiving beautiful etched wine glasses and 4 sets of D-Lua Park Travelling boots many thanks to David Sommerville and Karen Johansen. This year we will also have beautiful turned timber trophies with a State buckle inset as made by Mackinder Endurance for the Putty ride if anyone saw them they are spectacular. These will be available to sponsors for $330 1st place; $220 2nd place and $110 third place in each division. This sponsorship includes constant PA coverage over the weekend, placement of banners and an advertisement in the NSW State booklet. Entry forms: Are now available and we hope to have your nominations in by 17th May. Camp booking fees are on the rear of the form. These are to be forwarded to Helen Lindsay at PO Box 440 Cowra 2794 with your cheque or emailed to kintamaniarabs@bigpond.com as the banking details are included on the form, please put your name as the reference. Catering: Del Rio will be supplying all catering for riders and support crews and the TQ15 committee will supply catering for all of our treasured volunteers and officials. A cabin close to the vetting area will be set aside as a catering and rest area for such volunteers/officials and personnel will deliver to those unable to leave their posts. Communications will be provided by WICEN via UHF radios and there will be a Leader Board in the communal area for those wanting to track their riders and we hope to have Strapper calls from around 5kms out. Firewood and Horse Feed will be available to be delivered on site at your cost. Manure stations will be a set of trailers at various intervals around the camp and bags provided on entry to park. Rubbish is to be placed in large blue skips provided by Del Rio also at various sites. Biosecurity: Our NSW State Championships 2014, the TQ15 Curtain Raiser, will welcome all unvaccinated and vaccinated horses. This was discussed at length at our meeting and it was felt that the threat is too minimal to fracture the current free interaction necessary to hold rides in NSW well south of any areas previously affected by the Hendra virus. This position will be reviewed in November 2014 before any decision is made on TQ15 as events unfold. It will still be highly recommended that those in 'Hendra' affected areas, vaccinate to minimise the event of a DPI lockdown. The 2014 Spanish Championship will be held 1-4 May in Girona. It is organized by the Endurance Club Hipic in Bascara. The 120 km race will take place Friday May 2, and the 160 km will take place on Saturday May 3. The event was a huge success, with the hundreds of participants and hundreds more support crews and spectators thoroughly enjoying the experience. Nearly 400 athletes were part of history in the making on Saturday morning as they competed in the first ever Dubai Desert Triathlon at Dubai International Endurance City. The world first event brought together the triathlon disciplines of cycling and running with the traditional Emirati heritage sport of endurance horse riding with the overall men’s triathlon being won by Shaikh Nasser bin Hamed Al Khalifa of Bahrain ahead of teammate Mikel Calahorra, with Diego Bellon Santos in third. The event, a partnership between Dubai Sports Council and Meydan and held under the patronage of Shaikh Hamdan bin Mohammed bin Rashid Al Maktoum, Crown Prince of Dubai and Chairman of Dubai Sports Council, was a huge success, with the hundreds of participants and hundreds more support crews and spectators thoroughly enjoying the experience. Participants could enter as an individual triathlete completing all three disciplines, or as a team of 2 or 3 to complete the 5km desert trail run, the 25 km cycle and the 40km endurance ride, and prizes were awarded to winners in the individual, teams, cycling and running sections. Second place in the women’s overall went to Ines Pintenat, with Sheelagh Pirzada in third. First place in the junior triathlon went to Atiq Hassan Ali. Prizes were also awarded to senior and junior teams, with Al Bararri -4 taking out the junior competition and Etihad Stables 1 taking out the senior. Dubai: The HH Shaikh Mansoor Bin Zayed Al Nahyan Global Arabian Horse Flat Racing Festival will continue to offer exciting opportunities to aspiring Emirati sportswomen. Speaking after the successful hosting of the HH Shaikha Fatima Bint Mubarak World Ladies Championship and Shaikh Zayed Bin Sultan Al Nahyan Cup at the Hippodrome de Toulouse in France, Lara Sawaya, director of the Festival and chairman of the Ladies Racing Committee in the International Federation of Arabian Horse Racing Authority (IFAHR) said, “I don’t think things could be better”. Manama, April 19 (BNA)-- Deputised by His Royal Highness Prince Salman bin Hamad Al Khalifa, Crown Prince, Deputy Supreme Commander and First Deputy Prime Minister, the son of His Royal Highness the Crown Prince Shaikh Isa bin Salman bin Hamad Al Khalifa honoured the winners of the Crown Prince Endurance Cup. The FEI has received signed host agreements from two of the Canadian and US cities bidding to host the FEI World Equestrian Games™ 2018. The bid teams from Bromont/Montreal (CAN) and Lexington, Kentucky (USA) have both confirmed their continued interest in hosting the Games in 2018. Lexington, host city for the Alltech FEI World Equestrian Games™ in 2010, returned the signed host agreement in advance of the deadline for receipt of the documentation, which expired at midnight CEST on 31 March 2014. The Bromont/Montreal bid had previously submitted the required paperwork and did not need to resubmit, but Equine Canada’s new President, Al Patterson, has officially confirmed to the FEI that Bromont/Montreal will remain in the bid process. Lexington, Bromont/Montreal, and Wellington, Florida (USA) had been declared as official candidate cities in December last year, and site visits of all three venues have recently been conducted by Tim Hadaway, FEI Director Games & Championships. However, Wellington withdrew from the bidding process just prior to the latest deadline in the bid process as Equestrian Sport Productions (ESP) was unable to deliver the commercial requirements put in place by the FEI. “It is unfortunate that Wellington is unable to deliver on the commercial requirements and has had to withdraw,” FEI Secretary General Ingmar De Vos said, “but we are confident that both Bromont/Montreal and Lexington have very strong bids. Following submissions by the FEI’s Evaluation Commission to the FEI Bureau, the candidates will present their final bids to the Bureau at its in-person meeting in June 2014. The host city for the FEI World Equestrian Games™ 2018 will be announced after that meeting. 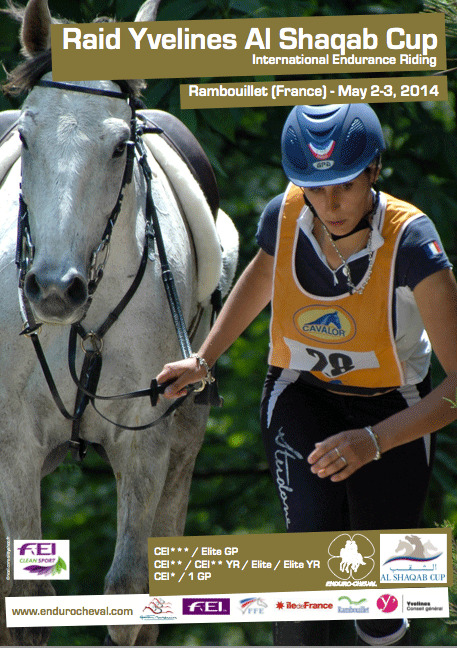 The seventh edition of the FEI’s flagship event will be held in France this year, with the Alltech FEI World Equestrian Games™ in Normandy running from 23 August - 7 September 2014. Nearly 400 athletes were part of history in the making as they competed in the first ever Dubai Desert Triathlon at Dubai International Endurance City. The world first event brought together the triathlon disciplines of cycling and running with the traditional Emirati heritage sport of endurance horse riding. The Alltech FEI World Equestrian Games™ 2014 in Normandy will also boast the exceptional presence of the Kingdom of Morocco, as the Games will honour the Barb horse and set the stage for top Moroccan riders*. Games spectators will therefore get to learn about the Moroccan Barb horse breed during the sports competition, but also though the Opening Ceremony, and the Games' exhibitions in the Games Village. A land passionate about equestrian traditions, the Kingdom of Morocco toils to preserve and showcase its valuable equine heritage. In Morocco, the horse represents beauty, nobility and a powerful socio-economic role that all Moroccans are proud of. The territory’s emblematic Barb horses are the embodiment of universality. Through history, they have made man rich and have had a significant influence on equestrian culture. The Barb horse thus boasts a particular appeal in Morocco, and this esteem is displayed by the national equine industry’s strategy of developing and promoting the breed. Furthermore, Morocco is the founding member of the Worldwide Organisation for the Barb Horse (OMCB) and currently presides over the organisation as part of a four-year term. * The “Horses in the Spotlight” project, which honours emblematic horse breeds from all over the globe, is one of the illustrations of Around the World in 80 Horses, the common theme of the non-sporting programme for the Alltech FEI World Equestran GamesTM 2014 in Normandy. These 80 stories about Man and Horses penned by Jean-Louis Gouraud, a writer and equine historian, will take spectators on a journey of discovery and will feature in various ways during the 15 days of compeition. The windy and wet remnants of Cyclone Ita have rained grief on the Fiber Fresh New Zealand National Endurance Championships, forcing the postponement of today’s competition in Canterbury. 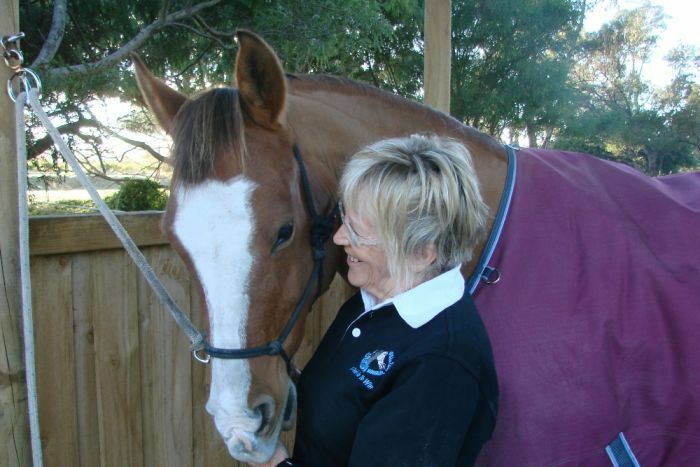 Central Otago horsewoman Susie Latta will ride, ride and ride some more this weekend. Latta (44), a farmer from Macraes Flat, is one of the leading contenders at the national endurance championships in Mayfield, Mid Canterbury. Sheikh Mohammed will no longer fund the clean-up of endurance racing and two of his senior employees have been dropped from the newly-announced task force in a sensational about-turn by the International Equestrian Federation. News that an apparent controlling role had been offered to Sheikh Mohammed – first revealed by Telegraph Sport last Friday – caused shock waves around the equestrian world as his Dubai stables are at the centre of the horse welfare crisis engulfing the sport. On Tuesday, the Dutch and Swiss equestrian federations strongly criticised what they called “collaboration” between the Sheikh and the governing body. Sheikh Mohammed, whose Dubai stables are at the centre of the doping and injuries crisis engulfing endurance racing, is funding the task force responsible for cleaning up the sport, the International Equestrian Federation (FEI) has confirmed. Two of the six task force members – lawyer Andrew Holmes and Mohammed Essa Al Adhab – are close to the Sheikh. This follows media pressure on the FEI to clarify its statement earlier this week that Sheikh Mohammed – whose family’s stables have provided more than 24 doping cases – had offered “full support” for the drastic new measures, after meeting FEI personnel on March 30. HH Sheikh Mansoor bin Zayed Al Nahyan Global Arabian Horse Flat Racing Festival helped lift the status of Purebred Arabian racing to a new high when the Dolby Studio in Los Angeles (the old Kodak Studio) staged a glittering night of the Darley Awards with the Powell brothers sharing six of the 22 awards on offer. April 17, 2014 -- The top athletes in endurance are set to compete in the 2014 Alltech FEI World Equestrian Games Endurance Team Selection Trail CEI2* 120 at Broxton Bridge Planation in Ehrhardt, S.C., April 18-19. Fifteen individuals will vie for a spot on the team that will compete in Normandy, France, on a course from Sartilly to the Bay of Mont Saint-Michel on Thursday, August 28. Currently, three competitors in this weekend's competition are tied for first place on US Endurance Rider Ranking List. Cody Boysen, Ellen Olson, and Heather Reynolds all have 500 points as of October 20, 2013.
photo: Amy Whelan with Max, one of her Arabian Horses. Mike James. LOUISA — Riding 50 miles a day is no big deal to Amy Whelan. She often saddles up for a quick 15 miles around her Lawrence County farm before breakfast. Her home-based boarding and training business feeds her passion for endurance riding, which pits her against other equestrians in daylong horseback treks. 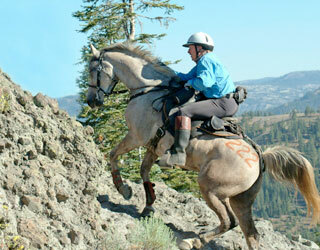 Whelan has been riding so long and for so many miles it may seem she has spent most of her life in the saddle. And it all has led up to what she anticipates will be her ultimate adventure this August, a 1,000-kilometer ride across the Mongolian steppes retracing the 13th-century postal route established by Genghis Khan. “It’s one of the last truly wild places on Earth,” Whelan said. She will be riding Mongolian horses, a tough, stocky breed indigenous to the region, sleeping and eating with locals or on the ground, and competing against more than 40 other riders. Whelan, 51, was introduced to endurance riding in her college years at Colorado State University, where she studied equine science. Endurance riders race for 50 or more miles under conditions that tax the rider, but under tight veterinary supervision to ensure the health of the horses. Riders have to finish a 50-mile race within 12 hours and a 100-mile race within 24 hours. The races usually are on trail systems rather than on tracks. This Easter weekend national sports media attention will be focused on some of Australia's fastest sprinters, as they compete in the country's most famous race, the Stawell Gift. In Tasmania, four legged athletes and their riders are competing in a sporting title that will last for days not seconds. 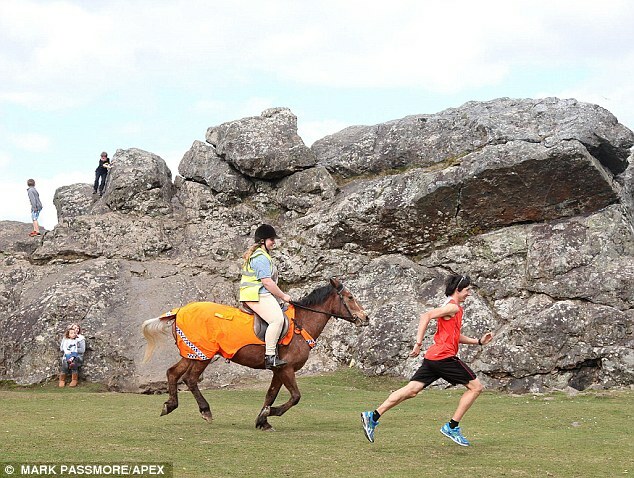 120 endurance riders are competing this Easter in the Van Diemen Marathon, a horse ride up of to 240 kilometres, in rough and rugged country, around Scottsdale in Tasmania's north-east. For one of Tasmania's seasoned riders, Trish Smith, the marathon is not a race. "I'm the sort of endurance rider, I don't believe in calling it a race. "It is not a race, it's a ride, our motto is 'to complete, is to win'", she said. "Everybody who actually completes successfully with a horse fit to continue by the vet is a winner." Trish has been training her Arab Rahn for years covering long distances. Longtime distance riding competitor Stephen Rojek, of South Woodstock, Vermont, became the newest inductee into the American Endurance Ride Conference’s Hall of Fame at their recent convention in Atlanta, Georgia. Rojek has amassed upwards of 25,000 miles of endurance competition since getting his start in 1986, including a staggering 176 100-mile rides. For rides of that distance, competitors have 24 hours to complete the ride. Fellow Hall of Fame member Valerie Kanavy of Fort Valley, Virginia, calls Rojek “The Centurion” because has more than a hundred 100-mile completions. As he accepted his award plaque at AERC’s national awards banquet in front of hundreds of fellow riders, Rojek modestly mentioned his most memorable time on the endurance trails as “Kansas in ’96 when we won the gold medal” — that would be the United States’ gold medal-winning performance at the World Endurance Championships. 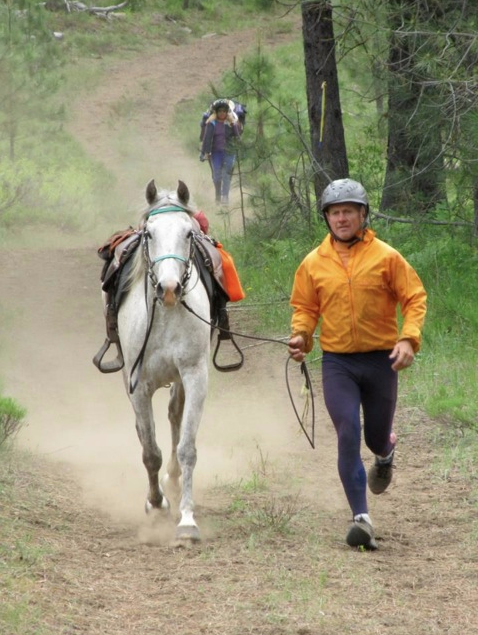 Rojek has competed in the North American Championships and the PanAm games for endurance riding and has won regional and national endurance awards most every season he’s competed. Presenting Rojek’s award was Susan Kasemeyer of Friendsville, Tennessee, the 2011 Hall of Fame winner. Kasemeyer, known for her saucy sense of humor, called Rojek “Mr. 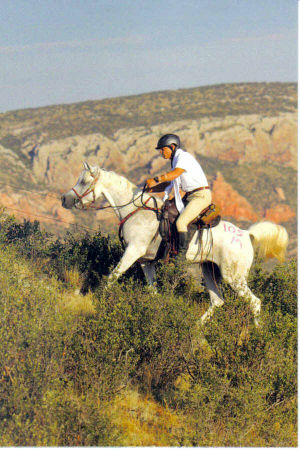 Clean,” and recalled his years of competing and managing endurance rides. She noted that he is also active in competitive trail riding, with an additional 30,000 Eastern Competitive Tail Ride Association miles. Rojek’s wife Dinah came on stage to add a few words, stressing that “Steve is the finest human being I’ve ever known.” On rides, she said, “He will stop to help, try to fix your horse’s shoe, give you his only Easyboot.” Many an endurance rider has a tale to tell about Rojek taking time out to assist on the trail, without worrying about his own finish. Rojek has ridden a number of horses, and with his predilection for 100s, has multiple horses with 100-mile equine mileage achievement awards. Currently he is campaigning Chi-Hi, a 2003 chestnut Arabian gelding (AHR 0602904), with 2,280 endurance miles, including 14 100-mile rides. Rojek is also bringing along Tupelo Ace, a 2003 grey Arabian gelding (AHR 0604175), with 425 endurance miles. 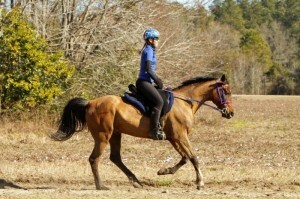 Endurance riding is like long distance running in many ways. Each person has their short and long term goals that hopefully align with their short and long term capabilities. The big difference is that your partner in this, your horse, is a flight animal and as such has abilities to "outrun " or overtax their system and running gear. It is our tough job to prepare ourselves and our horses to easily perform the distance and pace asked of them. With smart riding, a good horse with the right preparation, great speed and distance can be safely and easily accomplished. With adequate rest in between, this same horse can be competitive for many years. Some day when you’re bored, checkout our AERC lifetime horse records. When the flag drops, the BS stops. Mags Motivator is a great example: 10 years racing, over 3,000 lifetime miles and at 17 years old finishes 2 minutes behind the winner and wins Best Condition at this year’s National Championship 100! The country’s best endurance combinations are en route to Mayfield in Mid Canterbury for this weekend’s Fiber Fresh National Endurance Championships, the finale of the season and the last chance to impress selectors for the FEI Alltech World Equestrian Games. In coming days nearly 100 horses – along with their riders, grooms, and supporters – will flood into the tiny town of Mayfield for the even, based at the town’s A&P Showgrounds. New Zealand’s best chance of standing atop the podium at the Games in Normandy in August could well lie with its endurance team. The team of five riders will be chosen in late May to go to France. The FEI Bureau has changed the make-up of the task force charged with finding practical solutions to the problems within endurance, following criticism of its composition. It has also changed its position on accepting funding for the task force from Dubai. The FEI said the bureau decided during its monthly telephone conference on Tuesday to review the membership following what it said were comments from several national federations. The two United Arab Emirates representatives, Mohammed Essa Al Adhab, who is general manager of the Dubai Equestrian Club, and lawyer Andrew Holmes, will be removed. The first replacement is Sheikh Khalid bin Abdulla Al Khalifa, of Bahrain, who chairs the FEI Regional Group VII, which has been at the centre of a year-long storm over welfare concerns and what some national federations view as a cavalier approach to the rules by some riders and some officials. Federations have also been angered by the level of doping infractions in the region in recent years. The FEI said Al Khalifa had a full understanding of the situation in the Middle East. SALADO — Michael Campbell hopes more people will give long-distance horse riding a try. Campbell, 64, is the new head of the American Endurance Ride Conference, dedicated to long-distance, competitive horseback riding. The group is established across the United States as well as in Canada. A longtime horse owner, Campbell stood near his stable, watching a friend brush one of his seven Arabian horses, which he described as the “most spirited” of all the breeds. He remembered his first long-distance horse ride with friends in Central Texas. Afterward, his friends asked him whether he would try endurance riding again. “I said, ‘Yes,’” Campbell recalled. Since then, he has said “yes” to many more rides, accumulating more than 11,000 miles during the past 20 years. The endurance rides fall into several categories: The shortest distance is 25 miles; the longest is 100 miles and must be completed in 24 hours. The FEI has cancelled its host agreement with the Danish organisation planning to host the FEI European Endurance Championship in 2015. The Association Molsridtet expressed its regret over the FEI’s decision, appearing to suggest it felt the world governing body could have done more to find a workable solution over differences between them. The association was formed in Denmark in 2009 to participate in the development of endurance riding and in 2012 it was awarded the hosting of the championship. The organising committee said in a statement released today that it had prepared much of the event and made appointments regarding the venue, accommodation, and the renting of facilities. It said it had the full support of local government officials and both Danish and foreign companies. He is the youngest person to have conquered 100 marathons and holds the world record for being the youngest and fastest person to run 10 marathons in 10 days. But Adam Holland has added another first to his list of achievements - beating a horse in a 10-mile race. The 27-year-old won the unusual contest, taking on Tango, a five-year-old 14.2 hands high Appaloosa Welsh Horse. The pair raced through the Devonshire countryside, taking on moorland and bridleways near Tavistock. The task force set up to develop practical solutions to solve the problems within endurance includes the head of Equestrian Sports New Zealand, Jim Ellis. The task force, announced this week by the FEI, has been asked to develop practical solutions to ensure horse welfare and a level playing field at endurance events globally. It will also look at deploying modern technology in a bid for equality and integrity in all endurance competitions. The FEI says it is hopeful that some of the solutions offered by the task force will be ready for implementation in time for the endurance competition at the FEI Alltech World Equestrian Games in Normandy, France, in August. The world of endurance has been split amid concerns over the level of doping infractions, welfare issues, and what some consider to be a cavalier approach to the rules shown by some officials and competitors in several Middle Eastern competitions within the FEI’s Group VII. Efforts to resolve the problems in endurance are gathering pace, with the FEI announcing “concrete steps” to bring about change, including Dubai-sourced funding for the recently announced special task force. Changes announced today include a sponsorship reshuffle affecting the upcoming FEI Alltech World Equestrian Games. The FEI has provided more details over the special task force aimed at finding practical solutions to bring the endurance controversy to an end. The issue has split the endurance riding community over drug infractions and welfare concerns in the sport centred on the FEI Group VII nations of Dubai, Bahrain and Qatar. National federations on both sides of the Atlantic have raised the possibility of a breakaway group unless the FEI can rein in the problems, including what some view as the cavalier approach to endurance rules taken by some competitors and some officials. Dubai: Dubai’s newest sporting event, the Dubai Desert Triathlon, will have more than 120 teams for the inaugural event, organisers announced on Thursday. The Dubai Sports Council has partnered with Meydan Racecourse to develop an innovative event which combines the traditional heritage Emirati sport of endurance horse racing with the triathlon disciplines of running and cycling. Organisers say they are delighted with the response received, not only locally, but also internationally, with registrations far exceeding expectations. “We are very pleased with the response we have had from the triathletes and endurance riders. It is clear that they are excited and enthusiastic to be part of something which may well be a world first,” said Nasser Al Rahmah, Director of Sports Events Department at Dubai Sports Council. Sheikh Mohammed, whose Dubai stables have been at the centre of the doping and horse injury crises in Middle East endurance racing, is supporting the creation of a task force to implement rule changes, the International Equestrian Federation has revealed. The task force will include representatives of IMG, because of its “extensive experience in reviewing and modernising competition structures in other sports”. Cornwall Farmers is supporting endurance rider Nicky Sherry as she trains for the World Equestrian Games, due to be held in Normandy, France this summer. Nicky, from St Breward on Bodmin Moor, is a member of the UK Elite Senior Team Squad. Endurance riders embark on controlled long distance riding up to 160km, with veterinary check points to ensure each competing horse is in good health. Next 2 and 3 May will be held the "Raid Yvelines Al Shaqab Cup", i.e the traditional (29th edition) international Endurance appointment in Rambouillet, which the Qatari Stud Al Shaqab has joined as a partner of the CEI***. A positive partnership since the association Enduro Cheval, who has negotiated this partnership without any other consideration than the use of her image, receives assistance to optimize the organization of the 2014 edition, which offers this CEI*** support of French national selection for the World Equestrian Games, but also a CEI**, a CEIYR** and two CEI*. Optimization that will delight the two hundred expected riders, the public, the exhibitors and the institutional partners of the association (the Yvelines General Council, the city of Rambouillet, the Regional Council of Ile-de-France, the Fédération Equestre International, the French equestrian Federation), and all towns and villages invested in the race. At the first meeting of the International Horse Sports Confederation (IHSC), the Fédération Equestre Internationale (FEI) and the International Federation of Horseracing Authorities (IFHA) confirmed that they share the same core values of protecting horse welfare and discussed in detail the different models under which both organisztions operate. The two organizations came to the conclusion that there are many commonalities and opportunities for further cooperation. Although there are operational differences due to regulatory requirements of our sports, both organizations are united by the horse and a shared philosophy built on our common values. The creation of a fund for joint initiatives to support the horse sports industry. Further to recent allegations in the United States raised by People for the Ethical Treatment of Animals (PETA) and reported on March 20, the IHSC strongly declares that animal cruelty has no place in its sports and urges the U.S. authorities which are investigating these allegations to leave no stone unturned. Moreover, the IHSC calls on PETA to immediately and as a matter of urgency share with the relevant regulatory bodies all the materials they might still hold with regard to horse welfare in order to allow them to undertake the necessary actions. Additionally, working groups were established to deal with the aforementioned issues. Seventy-two national federations (NFs) have declared their intention to participate in the Alltech FEI World Equestrian Games (WEG) 2014 in Normandy, France, meeting the 31 March deadline for entries in principle. The number is an all-time high and represents a 10% increase compared to the entries in principle for any of the previous WEGs . At this initial stage, the NFs have indicated the disciplines in which they intend to be represented by a team or individual athletes. Although the final participation will be confirmed first by the nominated and ultimately by the definite entries, this is a significant first step in the games entry process. The disciplines that have attracted the greatest number of nations are jumping with 57 NFs, followed by endurance with competitors from 50 countries. Australia, Austria, host nation France, Great Britain, Germany, the Netherlands, Switzerland, Sweden, and the United States have entered teams in all FEI disciplines: jumping, dressage, para-dressage, eventing, driving, endurance, vaulting, and reining. Twelve countries will be making their WEG debut—Hong Kong, the U.S. Virgin Islands, Kazakhstan, Republic of Korea, Latvia, Morocco, Mauritius, Peru, Palestine, Romania, Thailand, and Tunisia—demonstrating the increased globalization of the FEI’s flagship event. The full list of entries in principle is available on the Alltech FEI World Equestrian Games 2014 website. The Dansawil Arabian Endurance team competed over the weekend of the 22nd March at the first ever 80km ride held in Maun. The team consisted of two locals Willie Herbst who is the owner, manager and groom and Tebogo Mosorwa on FTB Magnifico. The other two team members were Louise Herbst on Fa’Nardi Zara and Felicity Cooper on Dansawil Gorbasjof. Another Dansawil horse, Wilshane Shakespeare was lent to a Maun rider. The track consisted of three 27km legs and the riders had to negotiate water, tight turns, mud and extreme humidity due to the heavy down pours Maun is experiencing. This weekend, the historical little town of Neville will host many horse and rider combinations for endurance and social rides. Camping will be at the shady show ground with all general amenities, come kick back and enjoy some nice scenery. The Lachlan Endurance Riders Club (LERC) have taken up the task with locals from the Blayney/Carcoar area. NELLIGEN will be the site of an endurance ride in July, taking in scenic Clyde River bushland. The South Coast Zone ride will be held on July 5 and 6, with 80km, 40km and 20km options. Organiser Jenny Shepheard said two previously successful rides in the area had presented access problems, so the ride base would be located 40 metres off the Kings Highway. “It is very easy to get to,” Ms Shepheard said. “The ride base is on the outskirts of Nelligen, off the River Rd (Shallow Crossing Rd). Is global unity still possible in the world of endurance? The endurance juggernaut grinds on, with only optimists still believing a solution is within reach at this month’s FEI Sports Forum in Switzerland. The much-publicised issues centre on several Middle Eastern nations within the FEI’s Group VII. Riders from stables owned by members of the ruling Maktoum family of Dubai received 3 of the 4 yellow warning cards handed out in Dubai (21-22 March). This comes as the FEI clamps down on rule-breaking in Middle East endurance. Proposed changes to the rules of endurance spell out more clearly the responsibilities of riders and trainers, and explains potential conflicts of interest for event officials. The proposals will be put to FEI member nations at the endurance roundtable talks in Lausanne, Switzerland, late in April on the second day of the world governing body’s Sports Forum. "I know if a horse likes me or not - it's just a feeling," says 90-year-old Ken Hobday, Australian endurance rider featured on "Today Tonight's Sensational Senior." Ken's love for horses and his love for endurance riding shine in this short but heart-warming documentary piece about this member of West Australian Endurance Riders Association.